Many, including this writer, have in the past blamed 'Americanisation of the media' for the remorseless decline in the quality of BBC broadcasting. But this week came startling evidence that the BBC has surpassed its transatlantic cousins to become the new gold standard for international radio awfulness. 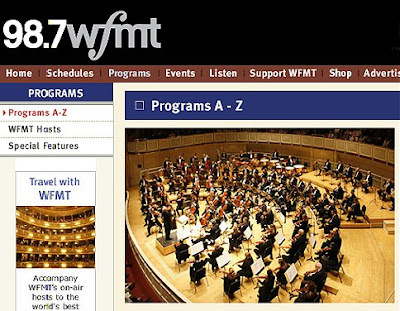 BBC Radio 3 has been broadcasting recordings of the Santa Fe Chamber Music Festival made by Chicago's only classical music station WFMT. Presumably the tapes (audio files?) of the excellent Santa Fe concerts came with the WFMT presenter's voice inextricably mixed with the concert ambience, so Radio 3 had no choice but to broadcast them complete with American continuity announcements. And what a revelation they were. Gone were the self-regarding BBC classical jocks elongating their vowels in a futile attempt to make the trite sound important, gone were the endless plugs for BBC house brands such as the 'new generation artists scheme', and gone thank heavens, but alas only temporarily, was Petroc Trelawny. And I am not even going to start on about Rob Cowan and colleagues daily pleadings for Radio 3 listeners to text in with details of their pet goldfish's breakfast. I am Glenn Gould and this programme is about Leopold Stokowski. More on this story here. Are words the new music? Everyone should be reading "On An Overgrown Path."